2016-17 was truly Russell Westbrook's year. He not only won the MVP award, but also averaged a triple-double the entire season. Besides achieving that feat in 2016-17, Westbrook also carried on that form and made a triple-double average in 2017-18. However much these impressive statistics may have awed people once, he finished fifth in the NBA running last season. At the start of this season, when the stats for probable MVP's came out, Westbrook didn't even make the cut. While we can take into consideration that the players ranked above him are all at the top of their teams in both form and gameplay, this shouldn't have dampened his chances that hard. At this point in the season, the running seems to be primarily between Giannis Antetokounmpo, Kevin Durant, and Anthony Davis. But here are some reasons why Westbrook can still make it. 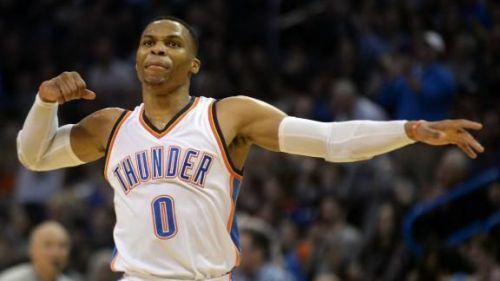 There are many people who claim that Westbrook's triple doubles do nothing for the gameplay of OKC, but they do not realize how easily he brings that many points home for the team. His moves may be low-key but Westbrook has the effectiveness very few people in the history of the NBA can match with. Further, in a countering statement to critics that believe that these kinds of stats are not those of an MVP, achieving these stats for a person who is tasked with the role of leading an entire team, is the work of a master. This is the kind of work that should convince voters to make him a second-time MVP. With the help of his teammates, hopefully, Westbrook will be able to keep up these kinds of stats. This will push OKC towards the top of the table in the West and make this man more and more eligible for the title of MVP.